Overland Park – Page 26 – Welcome to Wyandotte Daily! The Southern Poverty Law Center is reporting that the man arrested in Johnson County for shooting three persons near the Jewish Community Center is a white supremacist and long-time anti-Semite. According to records from the Johnson County Jail, the man arrested was Frazier Glenn Cross, 73, of Aurora, Mo. He was booked on charges of premeditated first-degree murder. He also is known by the name Frazier Glenn Miller and is the former “grand dragon” of the Carolina Knights of the Ku Klux Klan, according to the Southern Poverty Law Center. He ran the organization in the 1980s, the SPLC reported. He subsequently formed the White Patriot Party, another white supremacist group, according to SPLC. SPLC reported that Miller is an anti-Semite who posted more than 12,000 comments on an anti-Jewish website. To view the SPLC website, visit http://www.splcenter.org/blog/2014/04/13/frazier-glenn-miller-longtime-anti-semite-arrested-in-kansas-jewish-community-center-murders/. 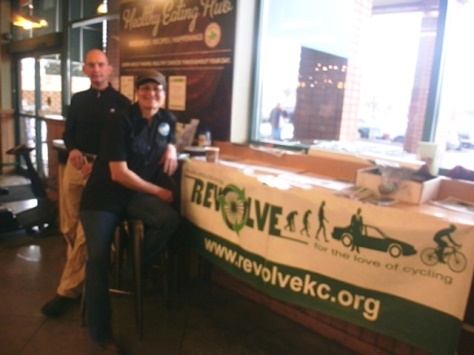 Revolve KC recently accepted donations in connection with a fundraiser at Whole Foods Market, 91st and Metcalf, Overland Park, Kan.
Five percent of the store sales on a recent day was donated to the Earn-a-Bike program sponsored by Revolve KC. According to Liz Bejan, the founder of Revolve KC, it was a huge success. “We got a lot of donations and this will help us out greatly,” she said. Revolve KC is the only program where youths may take a bike safety test and receive a reconditioned bicycle. With the summer months coming and the many bike trails that there are in the Kansas City area, bicycling would be a great way to get fit and a way to save gasoline as well. Revolve KC has an office at 554 Central Ave., Kansas City, Kan.
For more information on how to volunteer or get free bikes, go to the website www.revolvekc.org. A Kansas City, Mo., man who robbed an Overland Park bank with a hatchet was sentenced to 15.6 years in federal prison on Tuesday in U.S. District Court, Kansas City, Kan. The U.S. attorney’s office said the man, Derek T. Brownlee, 35, Kansas City, Mo., pleaded guilty to armed robbery of the Metcalf Bank, 7800 College Blvd., Overland Park, last July 1. He wore a bandanna over his face and carried a hatchet in the robbery. The complaint alleged Brownlee jumped over the teller’s counter, demanded money, took cash from a drawer and personal items, then led police on a chase of up to 90 mph before being stopped in Kansas City, Mo., where he was arrested after trying to flee on foot.